We are very happy to announce that our new glass shop extension, complete with trade counter, is now open for business! We are now able to provide some of the top brands that the glazing and construction industry has to offer, combined with the finest tools at the very best prices. 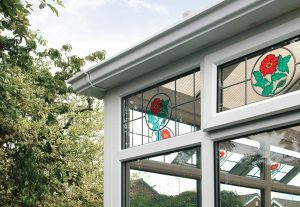 Presenting a range of high-quality glazing, window, door, roofline and conservatory products and components essential to getting the job done properly, we also have a dedicated team of professionals on hand to answer any questions or queries that you might have. What does the Leamore Windows glass shop offer? Decorative glass shapes, with inclined edges, that bond to glass surfaces to enhance window & door designs. A wide range of shapes, sizes, colours and styles available. Available in a variety of designs, styles and privacy levels, Pilkington provides the biggest range of textured & patterned glass that effectively conceal homes from the outside world. The increasing demand for coloured profiles is changing the face of the typical British home. Allowing homeowners to create exterior aesthetics that are as unique as they are, exciting new colour options include on-trend Anthracite Grey, calming Chartwell Green, as well as various natural woodgrain effects. Don’t forget that our new factory is in the process of being built too, which will be dedicated to manufacturing the premium Residence Collection and the timeless Modus Flush Sash range. Simply bookmark our news feed and ‘LIKE’ us on Facebook or follow us on Twitter to keep up with all our latest company news and views. Book an appointment with our professional, knowledgeable and friendly team who will be happy to help. Offering free, no-obligation double-glazing repair quotes, simply let us know what products you’re interested in. Visit our new Glass Shop extension with trade counter Leamore Windows; supporting the local community through sport Looking for wood effect UPVC windows? We manufacture and install the popular Residence Collection!